Smart Communications has just rolled out a promo perfect for prepaid-phone-toting social media fans! 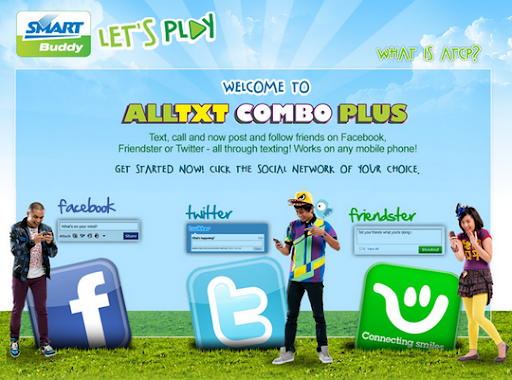 With Smart AllTXT Combo Plus, you can call, text, send MMS and get in touch with friends on Facebook, Twitter and Friendster -- all on a budget! There are 2 packages with 3 social network variants each to choose from. The first one is Smart AllTXT Combo Plus 25, which gives you 110 texts or MMS, 5-minutes worth of calls and 40 posts to 1 social networking site -- all valid for one day only. There are 3 sites to choose from, Facebook, Twitter and Friendster. Again, you may only choose one. The second one if Smart AllTXT Combo Plus 50, which gives you 220 texts or MMS, 10-minutes worth of calls and 80 posts to 1 social networking site -- all valid for one day only. Again, there are 3 sites to choose from, Facebook, Twitter and Friendster. You may only choose one. How to subscribe to Smart AllTXT Combo Plus Promo? Click on the All Txt Combo Plus Banner Ad. You will be redirected to the All Txt Combo Plus registration website. Select which social network you wish to register to – Facebook, Twitter or Friendster. Enter your Smart Buddy mobile number. A verification code shall be sent to your mobile number which shall then be entered online. Upon successful verification, you will be asked to log in to your Facebook, Twitter or Friendster account using your existing username and password. a.) Select 10 friends to follow. b.) Customize your texts and define how many etxts shall be assigned for posting to your Social Network and how many texts shall be allocated for sms updates from your Social Network. c.) The default settings for texts is 10 posts to your SN (Social Network) and 30 updates from your SN for All Txt Combo Plus P25 and 20 posts to your SN and 60 updates from your SN for All Txt Combo Plus P50. Customized texts will take effect once you avail of a new All Txt Combo Plus package. If you have already availed of an All Txt Combo Plus package, the customized settings will take effect on your next purchase. d.) You’re done, now get an All Txt Combo Plus Package! Online registration is one time only. You don’t have to re-register if you avail of a new All Txt Combo Plus package. However, if you wish to avail of all three packages (All Txt Combo Plus Facebook, Twitter and Friendster), you need to register to each SN online at smart.com.ph/buddy. 2. Avail of an All Txt Combo Plus package via Eload. (AllTXT Combo Eload will be ready by August 12, 2010). After registering your Social Networking account and mobile number at smart.com.ph/buddy, you may now avail of an All Txt Combo Plus Package of your choice via registration or Eload. To avail via Eload: Go to your nearest Smartload retailer and ask for the All Txt Combo Plus package of your choice. 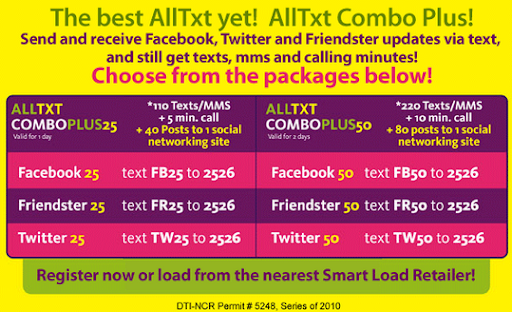 Enjoy Smart All Txt Combo Plus from August 1, 2010 until October 31, 2010.